Hero Histories: Don't Call Her "GIRL Reporter"! Don't Call Her "GIRL Reporter"! 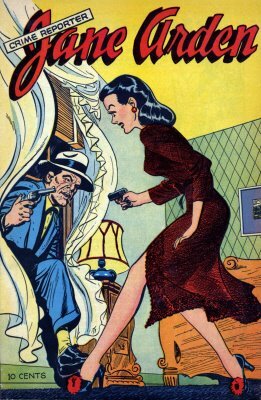 Jane Arden: Crime Reporter ran from 1927 to 1968, predating other female reporters like Brenda Starr: Reporter and Superman's Lois Lane by over a decade. She's best-known as the FIRST American comic character to have a World War II-related storyline when her writers tossed out the strip's ongoing gangster plotline in a single daily strip and sent her to cover the warfront on September 25, 1939, less than a month after Germany invaded Poland! Like most major 1930s-1950s comic characters, she was multi-media, with a radio show that ran for two years, a low-budget b-movie (that, while beeing pretty good, didn't do well enough to warrant a series) and comic books. We at Atomic Kommie Comics™ feel that she deserves to return to the pop culture spotlight, so we've digitally-restored and remastered the best covers from her comic book run for a line of collectibles in our Heroines™ section for girls and women who want a strong, positive role model! Have a look at Jane Arden: Crime Reporter, 'cause if you're doing something bad, she's looking for you! Blazing Action with...the Blue Bolt! The Coolest Hero of All--Sub-Zero Man! "The Cisco Kid was a Friend of Mine..."